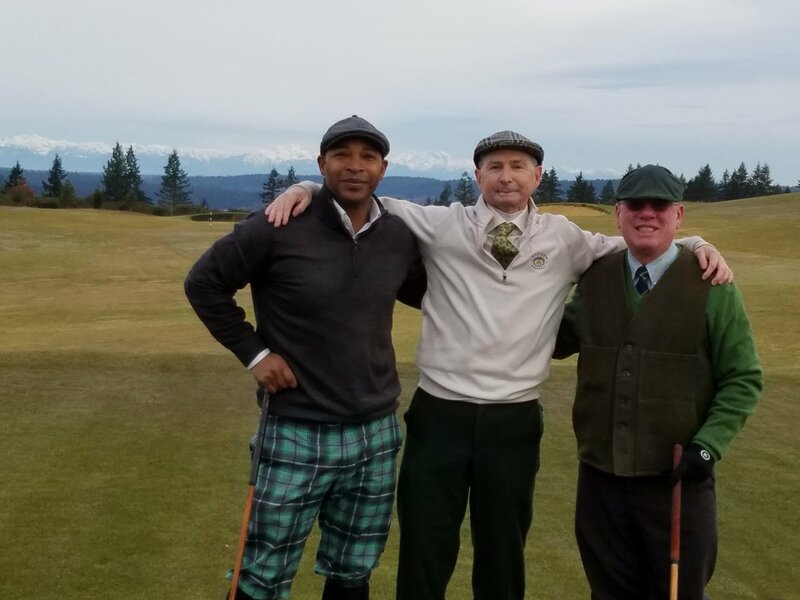 The story of a long-time golfer's path to becoming a Hickory Golfer. I've previously pointed to examples of cost-saving, like converting thrift store trousers into Plus Fours (Total cost: $3). Well, my latest experiment was to construct a bipod stand to hold up my golf bag. These are listed in the spendy golf bag catalogs for $45, and they are very nice...but I can't afford that. So I stopped by the local Home Depot yesterday, and for a total cost of $6.27 I purchased a couple of 3/4 inch square dowels, some brass machine screws, washers and nuts, and made my own set. Since this was a trial run, I didn't varnish the dowels, but I will make another set later this season with all of the steps. As for the golf bag, although the kind gentleman who sold me my clubs included a very lightweight vintage canvas bag, I needed something sturdier. While eventually I may end up ordering one of those top-end leather and canvas reproduction bags ($200 at a minimum), I got a nylon-canvas "pencil bag" for $20 on Amazon.com...and then my regular golf buddy happened upon a vintage but good condition leather pencil bag at a thrift store, which he acquired for me...$5! So now I'm fully outfitted to stroll alongside the Hickory OGs without looking like a complete "Hickorookie"...even though that's who I am! Welcome to the world of hickory golf. Thank you, sir! Please look me up if you find yourself playing in Western Washington! 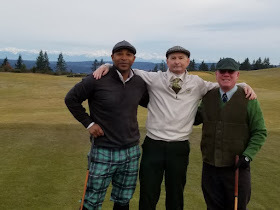 Retired cop, aspiring writer, golfer and seasonal golf course employee, used-to-be emergency management guy , and a Former Army Person from somewhere in the Pacific Northwest.